Rolling Stone did a list of their 10 Worst Songs of the '70s. It's surely a decade that's ripe for such choices, but here are some thoughts. 10. "Loving You." Oh, come on. There are thousands of songs worse than this one. It's not my favorite, but it's kind of pretty. I've been to Minnie Riperton's (mom of Maya Rudolph) grave, and the opening notes of the song are carved on it. 8. "Billy, Don't Be a Hero." As I talked about earlier, this was my favorite song of first grade, I made my poor sister drive all over town to buy me the 45. 7. "Seasons in the Sun." Yay, the death song. How is this song not #1? Goodbye Michelle, my little one! 6. "Escape: The Pina Colada Song." Oh man, total guilty pleasure here. Check out this fun fact: The lyrics originally went "If you like Humphrey Bogart," at the last minute he changed it to "pina coladas," a drink he didn't even particularly enjoy." 5. "Muskrat Love." This was also in my piano book. "Shop Around" was my favorite Captain and Tennille Song, though this may be the only song ever with weird little muskrat chirping sounds in it. 4. "You Light Up My Life." The trifecta! It's official, I had THE worst piano book in the history of the world. Because yes, this was in there, too. Read about what happened to the songwriter and you'll never hear this tune the same way again. 3. "(You're) Havin' My Baby." On second thought, how is THIS not #1? 2. "Afternoon Delight." OH COME ON! Why is this song even on here, let alone as high as second place? It's catchy and fun, and no 'Seasons in the Sun." And as they said in "Anchorman," "if you don't think this song is the greatest song ever, I will fight you." 1. "Disco Duck." What? Why would a novelty song even be considered for a list like this? It's a parody! 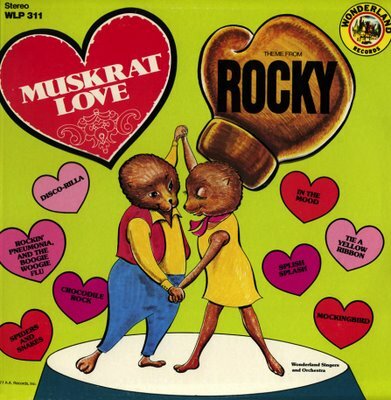 And when it comes to animal sounds in '70s songs, "Muskrat Love" is way, way worse. Side note: My husband grew up in L.A. where Rick Dees was a DJ, and when I ask him for the temperature he often tells me it's "75 (or whatever) Dees Grees," which I seriously hope is a hangover from a childhood of listening to Dees give the weather, and not just weirdness on his part. What do you think? What's the worst 1970s song ever, and what do you think of this list? Most kids of the 1970's remember all of these songs, some more fondly than others. I think all of these deserve to be on the list (including Disco Duck, parody or not, this song was really bad, although you're right, Muskrat Love is probably a bit more deserving of being on this list) -- my personal feeling is that virtually anything by Captain and Tennille deserves to be on a list of bad songs. I also think you're right about Minnie Ripperton's "Lovin' You" ... after all,how many singers have a five and a half octave range and can do it competently, so while South Park may have parodied this song, it probably doesn't deserve to be in the top ten. Finally, do you remember that Lindsay Wagner sang "Feelings" in the Bionic Woman? Yes, you can catch that clip (for the moment, anyway) on YouTube at http://youtu.be/zye2J6KPek0). Top of the list should be Ray Stevens' The Streak. I thought that song was irritatingly stupid, and I was a 7-year-old boy! Then again, I couldn't stand Everything is Beautiful much, either. Ordinarily, I'd say this kind of thing is purely a matter of opinion, and that's just what I was thinking—until I got down to "Having My Baby," which deserves the number one spot on any worst list I can imagine. Why? Because it maketh a blight upon the land. I could live without ever hearing "Indian Reservation" by Paul Revere and the Raiders again, but it's not the worst song of the 70s. "Playground in My Mind" by Clint Holmes wins that title for me. "My name is Michael, I've got a nickel..."
I apologize if that is now stuck in your head. That was obviously a typo, because these are the BEST songs of the 70s!I even did a baton twirling routine to Muskrat Love when I was six or seven. Good times. Good times. Seriously, was that just 10 random 1970s songs that the list makers happended to remember? Any list like this without "I've Never Been to Me" and "More, More, More" is totally bogus. What really worries me is that three of the ten are penned/performed by Canadians. Afternoon Delight , Seasons in the Sun , and of course Having my Baby. Way too many given the population of the country and the size of the music industry at the time. I agree with most everything that's been nominated here (except for "I Shot the Sheriff")... plus I would add pretty much anything by Bread. Especially "If", which I believe federal law mandated be played at every wedding in the '70s. Well there was "Timothy" - any song involving a story about cannibalism has to be top ten worst. The absolute worst 70s song for me is "Telephone Man" by Meri Wilson. "Then my fingers did the walking on the telephone man!" It was also the era of maudlin story lyrics, which are cringe-inspiring. "Wildfire," "Run Joey Run," "The Night the Lights Went out in Georgia," "Ruby Red Dress," and "Delta Dawn," just to name a few.